We love to motivate our runners and sweetening the reward for reaching race goals. With seven Challenges available in the 2017 schedule, we’re hoping everyone can find something that encourages them to further greatness. Check out the goods you’ll earn and please review details and requirements for each Challenge (subject to updates, so check back as those events get closer!). You may participate in more than one HMF Challenge but you may NOT use one event for more than one Challenge (i.e. 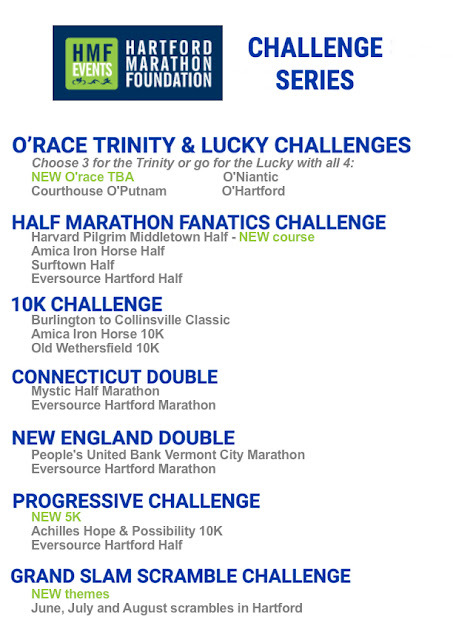 you can participate in Trinity Challenge and Half Marathon Fanatics, but you may not participate in Half Marathon Fanatics and Connecticut Double since both events end in the Eversource Hartford Half. No event substitutions allowed. If you wish to participate in the Half Marathon Fanatics and upgrade to the Eversource Hartford Marathon in place of the Eversource Hartford Half Marathon, you may do so within registration. 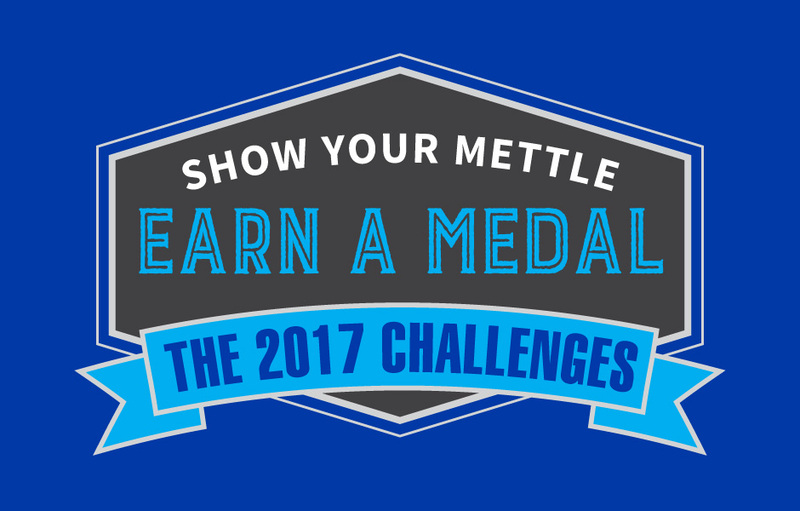 Follow instruction on the Challenge page for registration requirements to guarantee your participation and swag. We cannot guarantee swag/rewards if you did not register properly. If you participate in a Challenge event using a comp/free entry, please register and pay for the Challenge as directed and then contact registration@hartfordmarathon.com with confirmed comp entry info to be refunded for the specified event. If you participate in a Challenge event using a comp/free entry, you will be responsible to pay a portion of the swag fee (based on set criteria) i.e. pacers receiving free entry to Half Marathon Fanatics events are eligible to participate in the Challenge but will be charged a nominal fee to cover swag costs. Medals/swag must be picked-up in the post-race area at the last event in the challenge (specified below). If you do not pick up on race day, you may pick up in the HMF offices or you can opt to have it shipped for $8. Please confirm pick up or shipping within 2 months. An Irish-themed medal masterpiece, your 3 or 4 medals will link together to form the Challenge prize medal. Plus, Lucky Challenge participants earn a custom pint glass to be picked up after O’Hartford on March 19. In addition to earning medals for each of the 4 half marathons and a series medal, Half Marathon Fanatics will also be rewarded with a high quality custom backpack for their running gear. Medal and bag to be picked up in the Bling Ring after the Eversource Hartford Half Marathon on October 14. You will be provided with a FREE training guide to help you train from the Mystic Half Marathon to complete 26.2 at the Eversource Hartford Marathon. Participants earn medals and shirts for each event and a flashy series medal, to be picked up in the Bling Ring after the Eversource Hartford Marathon. After earning three unique medals in beautiful destinations around the state, participants will pick up their series medal in Old Wethersfield on August 27. Participants will get a FREE training plan to lead them from 5K to 10K to half marathon. At the end of the quest, pick up a newly designed series medal in the Bling Ring at the Eversource Hartford Half Marathon on October 14. Add this newly designed huge series medal to your collection. You’ll earn themed race swag at each event and then collect the big bling after the last Riverfront Scramble on August 24. Register separately through each event page and add the option for the Double. Participants will pay a $20 series fee and earn a series medal and a high quality technical vest, to be picked up after the second race they complete. We are thrilled to open registration for the 2017 season with a brand new Web site and some twists to the race schedule. Thanks for your patience and support as we worked on behind-the-scenes details (the many, many details!). The site was a true labor of love, as everyone on staff poured over info on each area of expertise they manage. While it’s a constant work in progress, it’s rewarding to share with you the progress that we’ve made. We know there are a few questions still to be answered (like where the new O’Shenanigans race is going to be held!!). We want to address why some details are still TBD and how the process works. Promise we’re not trying to hold out to build suspense here…just like that fine wine (or maybe more like a stout beer, in this case), some things take a little more time. That really big detail we don’t skip to confirm a race date is the town permit, but just as important is the community support. We want everyone to be on board when we bring a few hundred (or thousand) of our running buddies together for a group run and party. Businesses in the area, local churches, neighbors most significantly impacted, town officials, police and medical response crews – these folks are all crucial to welcoming you with open arms to take-over their roads. We also have to make sure we have the staff resources and volunteers required; that the locations and distances offered across the full HMF schedule work together; that other events taking place are considered. That’s just the top-tier check list to start working from, then we get into race swag, challenges and promotions and other considerations to help make the experience unique and interesting for participants. A new race takes special attention and we don’t want to release a date/location unless we are confident all of those factors line up to make it a go. So…where does that leave us with O’Shenanigans and the TBD new 5K on the calendar in June? We really want to make them happen, things are looking really good – but we don’t want to jinx ourselves. We may have Irish luck on our side, but until we get everything else on our side, we’ll have to leave you in suspense a little longer. And, hang on to your hats for this one…we’re in talks for a new half marathon late in the fall too. It’s a totally new great place to run with us. We promise you’ll be the first to know when it’s ready to go! 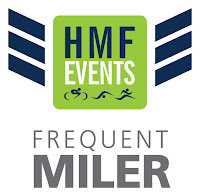 If you haven't signed up yet for the 2016 HMF Frequent Miler rewards program, the deadline is Monday, December 5! Sign up here. All registered Frequent Milers were sent an email Friday, 12/2, to the address they registered with. You can check the status of your eligible 2016 races through your ChronoTrack account, details available here. Note - we track your events through your email address so it must be consistent for all the events you ran in 2016*. Bottom line, you get cool stuff for running with us!! Check out the details below and be ready to redeem rewards in early 2017. We'll send you an update email once all eligibility is verified (expected in January). You must enter your name and email exactly the same way on both the sign-up form and on all race entry forms to ensure points are captured correctly. You must register for Frequent Miler program by December 5, 2016. You must be a registered participant in at least five HMF events in 2016 to earn the points per mile. Promotional race entries (giveaways or comp entries provided through HMF or HMF partners) do not count toward event or points per mile credit. The following races do not apply to the Frequent Miler Program: Zero Prostate, Mahoney Sabol, CT Race in the Park, Rentschler 5K, Achilles Hope & Possibility, Pumpkin Run, and Norwich Winterfest. Points are based on RUN miles only. (so, a triathlon will count for the number of miles in the run portion only). Points can only be used within the Frequent Miler Shop within the designated time, to be determined and provided to all participants in advance. Points may not be transferred. 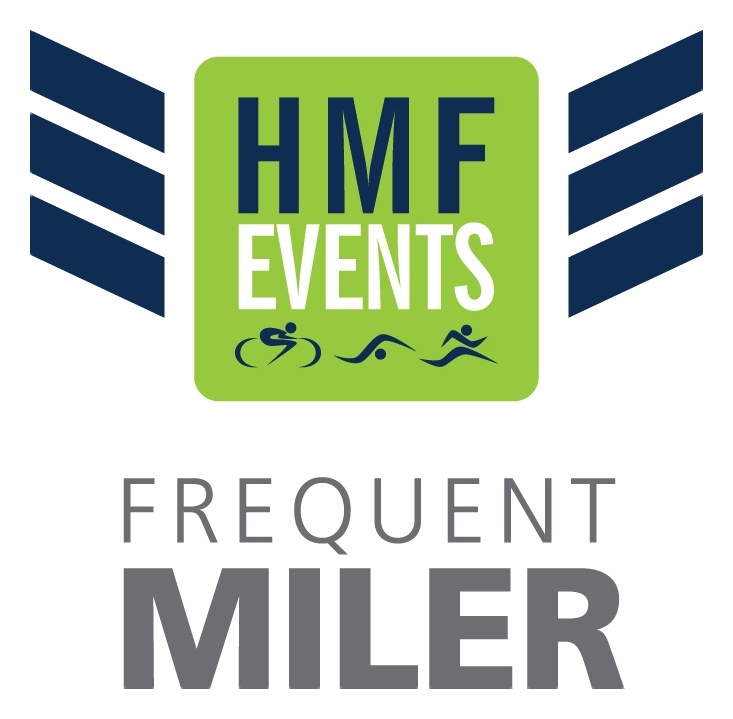 *If you have previously unsubscribed from HMF emails we are unable to confirm your registration to the Frequent Miler program. You must allow emails from us to get the details on the program or we can't reach you! !